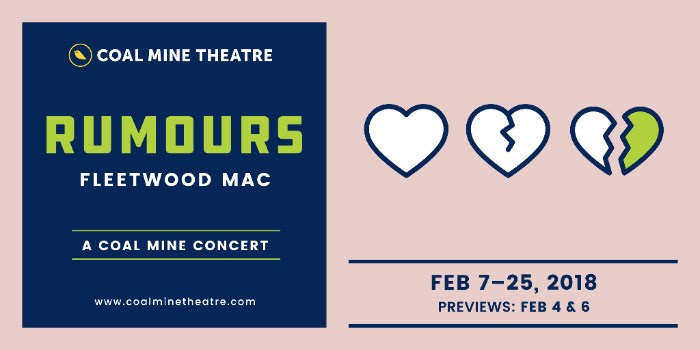 Coal Mine Theatre is proud to present the first ever Coal Mine Concert, RUMOURS by Fleetwood Mac, February 4-25, 2018 at the intimate Coal Mine Theatre. Released in 1977, Fleetwood Mac’s Rumours is the seventh best-selling album of all time (the third best-selling 70s album), moving 800,000 copies per week at its height and selling more than 40 million copies to date. With the arrival of Rumours, Fleetwood Mac underwent “that alchemic transmigration from lead to gold” according to Rolling Stone’s five-star review of the record. Its success made Fleetwood Mac a cultural phenomenon and set a template for pop music forever. Harkening back to the days when legendary clubs like the El Mocambo, Silver Dollar Room and Horseshoe Tavern were packing them in–the air stale with cigarette smoke and spilled beer–the Coal Mine Theatre is the perfect place to recreate that immersive club feel and present a straight up rock ‘n roll concert of the entire album. “Two years-ago I was driving around town and listening to Rumours for the first time in a long time, but I still knew every note. At the same time, it was like I had never heard it before. The complexity, the simplicity, the musicianship; surely one of the finest records ever made." Today, Ted Dykstra, Coal Mine Co-Chief Engineer and RUMOURS creative guide, has assembled a killer group to play the album live–joyfully, respectfully, authentically–up close and personal at the Coal Mine Theatre. Ominously romantic while dealing with the break-up of the quintet’s two couples, Rumours, which appears on the surface to be an album of love songs with heavenly harmonies, is a contradiction between its cheerful surface and its anguished heart. This is not a re-interpretation of the record, nor a jukebox musical, this is Rumours as you know and love it! Lead guitarist and vocalist, Mike Borkosky is a musician who has played with Alannah Myles, Carole Pope, Sass Jordan, Lee Aaron, Canadian Idol; a producer who has worked with illScarlett, Low Level Flight, Rex Goudie, Melanie Doane, Sabrina Whyatt, Creepy Crawlies; and lead vocalist for the band The Test Icicles. Toronto vocalist and songwriter, SATE combines blistering hard rock and gritty funk with “a tornado of a stage presence,” (NOW). Her full-length debut album, RedBlack&Blue, was declared one of 2016’s most anticipated releases by the Globe and Mail. Daughter of Salome Bey, and formerly known as Saidah Baba Talibah, SATE understands desire and is prepared to sate it! Andrea Ramolo is a multiple Canadian Folk Music Award nominee, and one-half of the acclaimed folk/pop duo Scarlett Jane. Her third solo album NUDA, produced by Michael Timmins (Cowboy Junkies) was released in 2017 and included in that year’s Polaris Prize Longer List. Andrea has performed alongside such Canadian artists as Gordon Lightfoot, Ron Sexsmith, Blackie and the Rodeo Kings, Lynn Miles and Adam Cohen. Multi-genre bassist, electric and upright, Jen Benton has performed nationally and abroad with Alex Lifeson, Andy Kim, Ron Sexsmith, Colin James, Dru, Kim Mitchell, Sam Roberts, Serena Ryder, august, Lily Frost, Lights, Sarah Slean, The Cliks, Luke Doucet, Divine Brown, Mark Holmes, and Lorraine Segato to name a few. She can also play a mean trumpet! Since graduating as a percussion major from the Humber College Contemporary Music program, Steven Foster has toured the world as a drummer, guitarist, singer and songwriter in bands such as Doldrums, Moon King, Jaron Freeman-Fox and the Opposite of Everything, Snowblink and others. He also has his own project, Omhouse; has composed music for a chamber ensemble; and has musical directed for theatre. Derek Giberson, on keys, has been playing professionally for nearly 20 years; as bandleader of the nine-piece powerhouse Professors Of Funk and member of the Julian Taylor Band, and with musicians Sass Jordan, Shakura S'aida, Chris Caddell, Emmanuel Jal, Tyler Shaw, Carvin Winans and Ivana Santilli. Sound designer and live sound engineer, Roger Psutka has worked with a diverse range of acts across the music industry including Our Lady Peace, Chantel Kreviazuk, Blue Man Group, Dean Brody, George Canyon, Remy Shand, Simple Plan, Sheryl Crow, and many more. Coal Mine Theatre presents fearlessly challenging plays, produced, directed, designed and performed at the highest possible level. With less than 100 seats available per performance, Coal Mine is inspired by the intimacy and excitement of the off-off-Broadway experience. The Coal Mine’s fourth season under Chief Engineers Diana Bentley and Ted Dykstra has presented The Aliens by Annie Baker and Poison by Lot Vekemans; and continues with Rumours by Fleetwood Mac: A COAL MINE CONCERT; and Category E by Belinda Cornish.